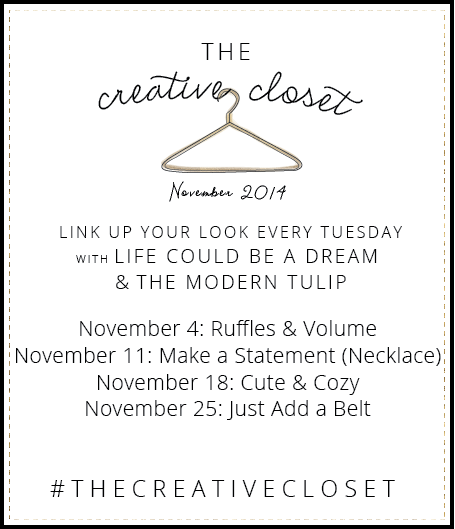 28 comments on "The Creative Closet || Cute & Cozy"
Your outfit is spot.on. in terms of cozy and cuteness! I love the layering of the different knits and soft materials. And your bed is beyond perfection, too! Obsessed with your bed too! You need to post how you did that headboard! Love it! And your outfit is SO cute! I need whatever camera/lens you're using too!! I know this post is about your outfit, but I'm totally hiring you to be my interior decorator! My kind of outfit! Loveeee your bed! Looks SO comfy! And gorgeous!! What a doll. Seriously. *heart eyes* You're adorable. I'm obsessed with your bed too, it's beautiful! Love the colors you've gone with. You look adorable and so cozy! Love this -- you look so cute! And we had the same vision when it comes to cute and cozy :) My pictures are taken on my bed too, although your bed is much cuter. I love your headboard! This is adorable. Adorably cozy!!!! I LOVE your outfit! And your bed!! haha I am reaching the point where I need to make our bedroom a little nicer...the 70s wood paneling is throwing me off. 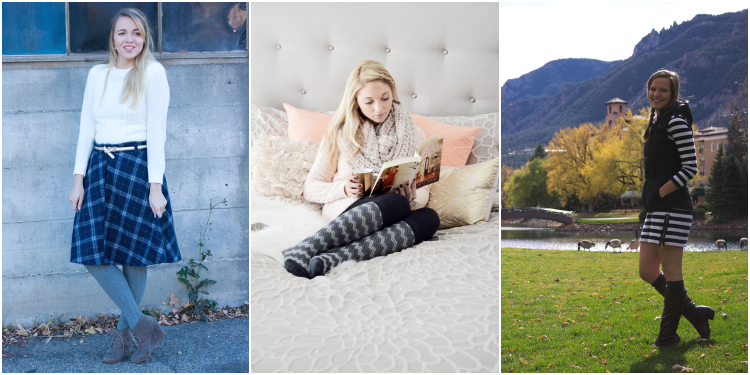 I love everything about these pictures, you look the definition of both cute and cozy! I can't believe you made that headboard yourself, my friend made a small one and said it took forever! I'm obsessed with your bed! My husband would never go for the pink pillows but I just might try to sneak them in! I also love the outfit! Thats my go to outfit for staying cozy at home! Love it all...the outfit, the bed...all just perfect! This reminds me, didn't you say you made the headboard? Was there like a tutorial for that? Or could you do one? I've been wanting to ask you about that. I've been in love with it since Blogger Happy Hour. That outfit looks super comfy and super cute! And your bed is so pretty! I love the colors and cozy it looks. Oh. my. gosh. LOVE your bedding!! Where did you get your bedding set? The subtle flower pattern is heavenly!!! Oh my gosh! You're so stinkin' cute and I know I say that every week, but it's totally true! Also, thank you for showing us (pretty much all the time) that you can look fabulous and not have to spend hundreds of dollars on a top!